This review was first posted on Music, Books and TeaDark Inside has been described as '28 Days Later' meets 'The Road'. I'd say that's a fairly accurate description. It has that post-apocalyptic feel of The Road, and the zombies from 28 Days Later (although this book didn't scare me as much as 28 Days Later did! ), all thrown together into one thrilling book.These aren't your typical zombies though. Whilst they still crave human blood, their main aim is to destroy all of the human race, not eat their brains. In fact, they're pretty close to fully-functioning human beings, as our four main characters certainly find out. The thought that all these Baggers, as Michael calls them, have been 'awakened' by an earthquake is creepy. Especially when you think about how many earthquakes happen each year in the world. It's quite easy to imagine something like this happening in the real world, if all it takes in an earthquake. 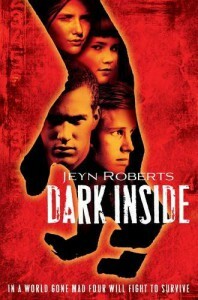 The more I thought about it, the more freaked out I got.Dark Inside focuses on four teenage survivors, Mason, Aries, Clementine and Michael. There's also a fifth narrator called 'nothing', which definitely ups the creep-factor in Dark Inside, especially when reading those chapters. I have my suspicions on who the 'nothing' chapters are focused on, but I'm going to keep quiet on those until I've read the next book, as I could be completely wrong in those assumptions, or I could be correct and spoil it for people who haven't read the book yet.I think it's safe to say that I appreciated all the characters in different ways, although I think that Aries was definitely my favourite of the four. Whilst all four of the teens were leaders, because let's face it, they didn't have much of a choice, she immediately took control of a bunch of teens, and did everything she could to make sure they stayed safe in her care. She also wasn't afraid of putting herself in danger if it meant saving her friends. Although I wished she hadn't been so hung up on Daniel, who seemed to just come and go as he pleased. There was something about his character that I really just couldn't connect with at all, but I'm assuming he'll play a larger role in the following books.Dark Inside is an absolute stormer of a post-apocalyptic book. I thoroughly enjoyed every single page of this book, and I cannot recommend it enough to fans of the genre. It's action packed, with barely (if any) romance, and it's just brilliantly written. I cannot wait for the second book of the series, Rage Within. If it's anything like Dark Inside, it's guaranteed to be amazing!